One of the biggest myths about credit scoring is that you only have one credit score. The truth is that you have several credit scores. While most people know about the FICO score because of it’s name and presence in the credit world, there’s another credit score to think about: the VantageScore. The VantageScore was created by the three major credit bureaus – Equifax, Experian, and TransUnion. According to its website, the Vantage Score is used by the top five credit card issuers, four top banks, and two top auto lenders. This makes the VantageScore worth considering in credit repair. The VantageScore ranges from 501 to 990 (vs. FICO range 350 to 800). VantageScore has also assigned traditional letter grades – A, B, C, D, F – to credit score ranges, to help you easily understand whether you have a good score, fair score, or poor credit score. If you have an A credit score between 900 and 990, lenders are more likely to lend to you and give you the best interest rates. On the other hand, if you have an F credit score, lenders probably won’t give you a credit card or loan. If you are approved with a VantageScore between 501 and 599, you won’t get the best terms, e.g. lowest interest rate. Like other credit scores, the VantageScore is based only on data from your credit reports. If it’s not on your credit report, it doesn’t affect your VantageScore. The VantageScore calculation uses six categories of information (vs. five categories used by FICO). 1. Payment history is 32% of your VantageScore. This takes into account how well you’ve paid your bills and how many accounts have derogatory information like late payments and collection accounts. 2. Utilization is 23%. 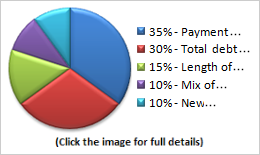 This is the amount of your credit card or loan balances. Using more of your available credit hurts your VantageScore. 3. Balances count for 15% of the score. If your balances have recently increased, your VantageScore may be affected. Additionally, if you have high balances you may have a lower score. 4. Depth of credit is 13%. This takes into account the amount of time you’ve bad credit as well as the types of accounts you have. The longer you’ve had credit and the more accounts you have experience with, the better your VantageScore will be. 5. Recent credit is 10%. Recent credit applications and new accounts can negatively impact your VantageScore. 6. Available credit is 7%. Having a large amount of available credit is better for your VantageScore than having only a small amount of available credit. Is VantageScore Better Than FICO? More people are familiar with FICO scores, perhaps because that score has been around longer. You should be concerned about whichever credit score your lender is using. Before you shop for a major loan, consider checking both credit scores. You can get your FICO score from myFICO.com and your VantageScore from any of the three credit bureaus. When it comes to credit repair, focus on improving your overall credit situation – use only a little of your available credit, pay your bills on time, etc. – and all your credit scores will respond.